Did y’all read the Moshboy interview from earlier this week? I thought we were hustling over here with our 3-ish games a week, but Steve is in a league beyond. 1000 creators over 3 years? That’s more than twice what we feature on this blog. I guess that means we’ll just have to work extra hard over here to make sure our recommendations are the best they can be! I mentioned in our Defense of Visual Novels piece how much I love the game Romance Detective. Well, unbeknownst to me the developer Nami teamed up with another artist who goes by Darkchibishadow to make Mermaid Splash: Passion Festival. Lucky for us, it’s just as pretty as the devs’ previous work. If you played Romance Detective (if not, go fix that) you’ll be familiar with Mermaid Splash’s visual novel trappings and all-ages-but-still-flirty dialogue but you may be slightly disappointed by the game’s writing. Yes the game is totally worth playing (it’s free!) but if you’re expecting something on par with Nami’s underrated masterpiece, you’ll leave wanting more. That said, there are multiple routes in this game so there’s certainly much more to it than meets the eye. A well made puzzle game is a beautiful thing. There’s something great about matching wits with a handcrafted task set out by a game developer that few other genres can beat. Unfortunately a lot of puzzle games run aground as soon as they make their systems overly-complex. Shn!p is not one of those games. The core mechanics of Shn!p revolve around blowing up and moving colored dots to clear the board. It’s a simple premise that quickly forces you to think several steps ahead as you work diligently to set up chain reactions in just the right way. As you can see in the gif above, the puzzles get pretty intense near the end. I’m a sucker for games with a sense of style. Sure things like mechanics, narrative, and soundtrack are important but if a game has unique visual flair I’ll forgive a lot. 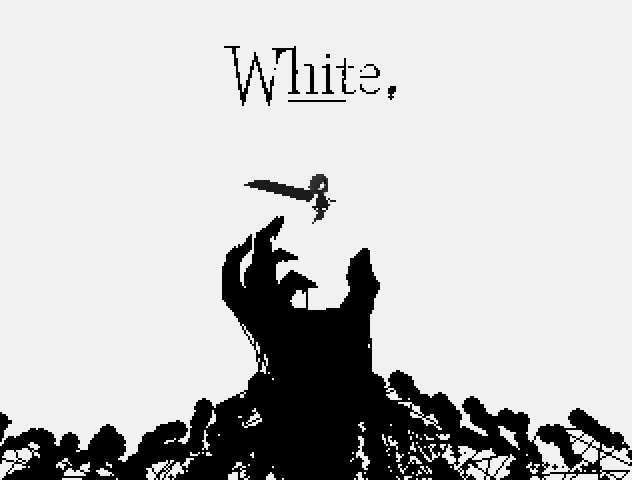 White was made as a part of the recent Games Made Quick jam and while it shows some of the pitfalls you’d expect from a game made in less than 24 hours it also has an awesome monochromatic style. It’s also got an awesome slashing mechanic that makes dispatching the black and white enemies into a stylish-spectacle. The developer has mentioned the possibility of doing an update soon that would add things like a story and a boss, but White is worth your time as-is. Oh, and it’s pay what you want.